With the approach of summer 1991, The Jellybean Odyssey, the half-hour pilot first written by Warren Easton and me two years earlier, ramped up for production. Under the terms of the Independent Production Agreement of the Writers Guild of Canada, when the actual filming begins, the writers are entitled to the balance of their total fee, which is calculated based on the budget for the film. For a relatively high-budge half-hour such as ours, this would ordinarily mean a payment of several thousand dollars, but Warren and I had had to tap the producer Michael Chechik for advances against this over the previous year or so, and therefore there was little or no extra fee for us. We had to keep other sources of income alive. But now there was the excitement of preproduction, including the casting of the show. Michael engaged the CBC casting director Sid Kozak to cast the show, and Michael and Sid thought it would be a good idea for the writers to be present for the auditions of the major parts. Now this was what I called fun: I got to sit in the little office used as the audition-room with Michael and Sid, while nervous actors waited outside to come in and read lines from the script. A video camera was set up to record their performances. The auditions took place over a period of days or maybe weeks. Soon I realized that Sid wanted me to explain the roles to the actors, so I had to come up with ways to describe the characters quickly so that the actors, who had never seen the script, could find a way to interpret their lines. Most of the auditions were by kid actors from the Vancouver area, although there were a couple of auditions sent in on videotape by Canadian actors living in the U.S.
For the first time, we got to hear our Jellybean dialogue spoken by actors. This was a thrill, but also a humbling learning experience, since dialogue and little jokes that had seemed brilliant to us, the writers, sometimes came out flat and lame from actors who didn’t really get what we were trying to say. The key with dialogue, as we learned over time, was to keep it simple and keep it short. Don’t count on anybody “getting” what you’re trying to do. So many kids read for different parts, and they were all so different from each other. Their personalities brought vastly different qualities to the different characters. The part of Jay Ziegler, of course, was central. Which kid to choose? Should our Jay be tough and cocky? Wily and shrewd? Innocent and cute? Warren and I reviewed a lot of auditions on tape with Michael and discussed them at length. Of course, it was not just our decision–the network had to approve all the main casting choices for continuing characters. But we should come up with who we thought was right, and be prepared to defend that to the network. 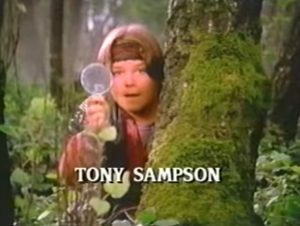 As I recall, the easiest pick among the three main kids was Tony Sampson as Keith and Flash. He came across as burly and a bit gruff, but also had a sensitive, expressive face and could bring nuance to a performance–he could act. It often wasn’t clear with kids whether they were really actors or just cute moppets and models. Tony was a good-looking kid, but not a cutie-pie, and he could deliver a performance and also take direction. Jay was a tougher choice. From early on Illya Woloshyn was a leading contender, if only because he was so telegenic with his attractive appearance and liquid brown eyes. But to us he was firmly in the “innocent and cute moppet” category–and Warren and I weren’t sure that’s what we wanted in our adventuring hero. I believe Warren was especially skeptical that such a doe-eyed hug-muffin could carry our adventure show. And yet the camera liked Illya very much, and his innocence and cuteness made him seem vulnerable and kind of tugged on the heart-strings: you’d want this poor lost kid to find his way home. But was he too nonassertive? We hemmed and hawed. I think the network liked Illya, who was already a working actor and had some decent credits. Eventually, maybe after some call-backs, he was cast. The part of Donna and Alpha, the lame girl who becomes Jay’s spunky and able-bodied female sidekick in the downworld, was another tough choice. Among the many girls who came in to read, Ashley Rogers (as she was then known) seemed among the least likely: young, small, and with Coke-bottle glasses. But she was relaxed and confident, and apparently had said, before coming in to the audition room, that she was going to get the part. She was a “real” little girl, and very natural on camera. She was very different from girls like, say, Vicki Wauchope, a beautiful blonde who lived in California and who sent in an audition by videotape. Her mother, who had made the tape, had taken the trouble to shoot Vicki wearing a leg-brace and using crutches, to better simulate the character Donna. She represented the option of going for “star”-type casting for the role. I remember talking over the auditions with Michael while we were on a CBC soundstage for some reason. Against all probability, we were inclining toward Ashley, up against a field of slightly older, prettier girls–she would be, as I put it, a “more creative choice”. We all liked her. I’m not sure whether the network had reservations about her, but anyway, she was the one we wanted to cast, and eventually the network accepted our slate of actors. The Jellybean Odyssey pilot was now cast, and we had that strange feeling of reality that comes when the characters in a script, who so far exist only in one’s imagination, now suddenly have bodies and voices–without knowing it, we had been writing about these people; who knew? For better or for worse, this was going to be our team. With the cast in place, our show was now almost ready to go before the camera. The next big hire: a director. Here the network had definite opinions. More on that later. This entry was posted in the odyssey and tagged ashleigh aston moore, ashley rogers, auditions, canadian broadcasting corporation, casting a tv show, ilya woloshyn, jay ziegler, michael chechik, pilot episode, ryan reynolds, scriptwriting, sid kozak, the jellybean odyssey, the odyssey odyssey, tony sampson, tv series, vicki wauchope, warren easton, writers guild of canada, writing for tv. Bookmark the permalink.